Adele specializes in Swedish Massage , Pregnancy Massage and Remedial Massage. The process was all very simple and easy – was very Uber-like. My massage was blissful. Adele was very professional and the music was very nice. I felt like I was in some spa in Bali. My husband came from work as we were finishing. Our therapist was available after my treatment, so my husband ended up getting a massage too! A. I used to work in the world of recruitment and Human Resources. I loved helping people with their careers but found that I wasn’t quite satisfied enough. I have always had a love of health and well being and decided to do what made my soul sing and that was to help others improve their well being through healing touch. A. From a client’s point of view I love that I am able to provide them with a therapeutic and nurturing massage at their convenience, in the comfort of their own home. From a personal point of view I love the freedom it affords me to be able to pick the jobs that work within my schedule and the variety element of meeting new people. The Blys team are pretty awesome too! A. Yes indeed: In a world that can be sooo stimulating and super stressful, being able to create an atmosphere of relaxation for a client, that enables them to be still and to connect with their inner self is extremely therapeutic. A. Everytime a client falls asleep as I massage them; I take it as a huge compliment. 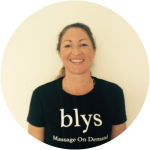 But I think the latest Blys client comment was pretty special ‘having the touch of a goddess’ made my husband laugh a lot! A. Bronte Beach bogey hole is my favourite spot especially on a quiet sunny week day.